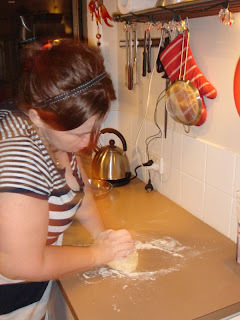 Cucina Povera: You don't have to be Italian to make fresh pasta. 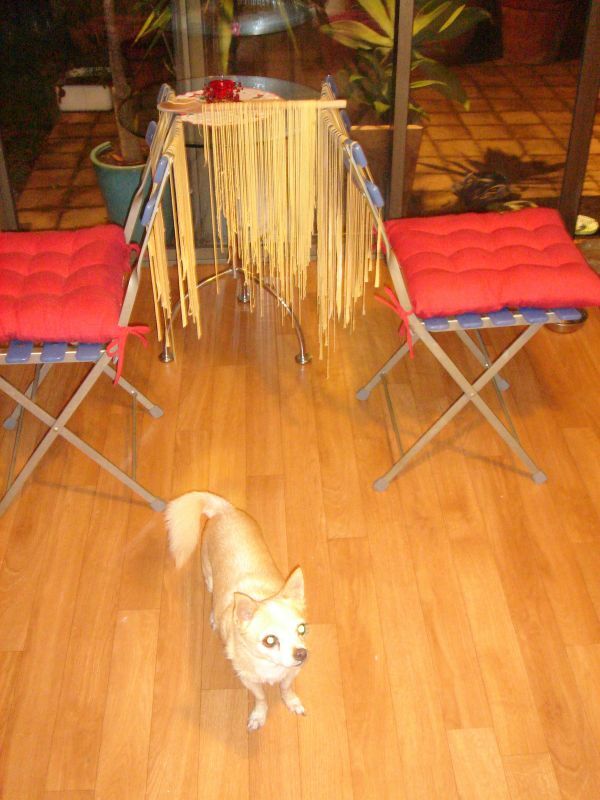 I am going to tell you that you can make your own pasta. 2. You can make your own fresh pasta - today, right now, and have it with your dinner tonight. A decent pinch of salt. Elbow Grease - Pasta making is a wonderful upper body workout! 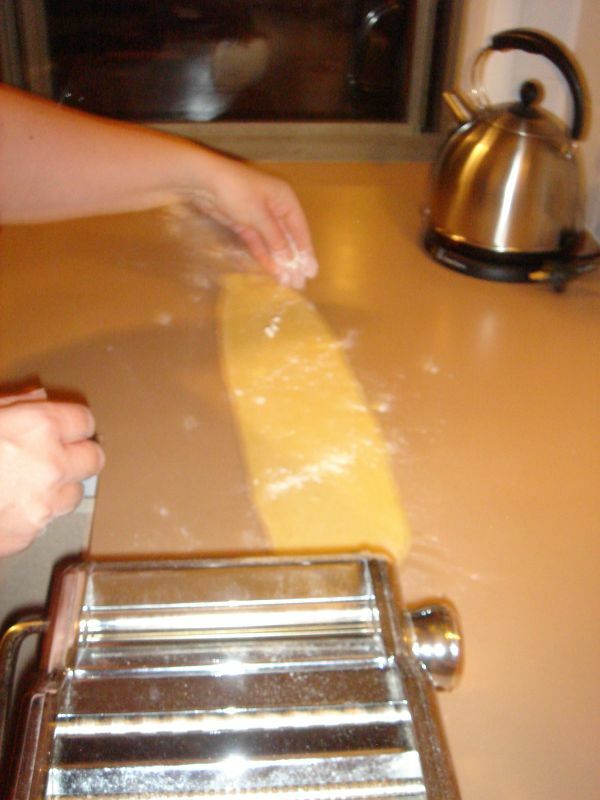 Pasta Machine or Rolling pin. 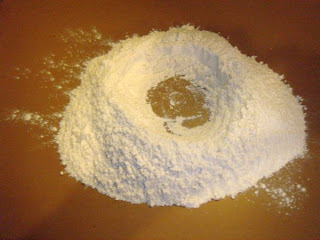 Measure out your flour and add a good pinch of salt. Tip onto a clean (stressing CLEAN here) bench top and kind of make a well in the centre. Make it look like a flour version of a mini volcano. Crack your eggs into the well and kind of swirl your hand around to break the eggs up and as you do, work the flour into your mix. 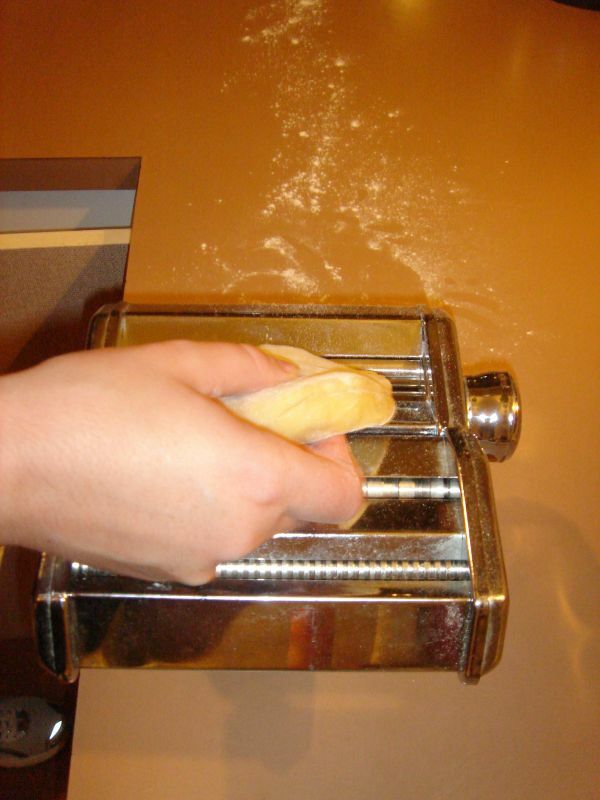 This can get a little tricky if your flour wall gives way and your eggs escape, but because you have meticulously cleaned your bench top, there is no chance of nasties getting into your dough. 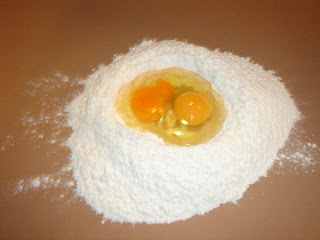 Work the flour and eggs until they become a nice ball of dough. Work the dough like you mean it. Be sure to add a light dusting of flour if the mixture is too sticky. You want to be able to roll it without it sticking all over your fingers. Give the dough all of your frustrations, your anger, your lust, whatever it takes to make it nice and smooth and silky and elastic. 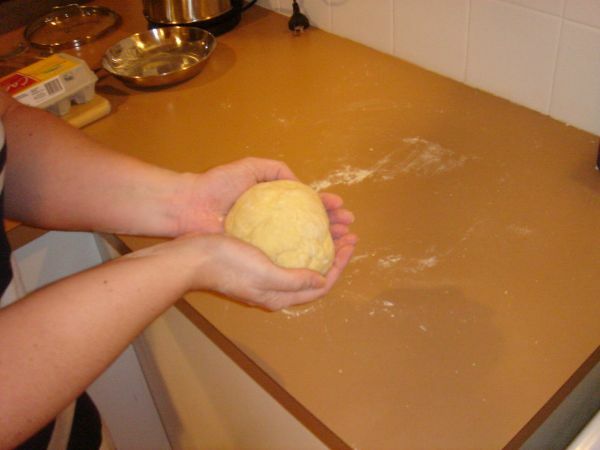 Wrap dough in cling film and place in the refrigerator for at least 30 mins to rest. This is an important step because you have given the gluten in the flour a great work out - you want it to relax for a bit before you roll it out. 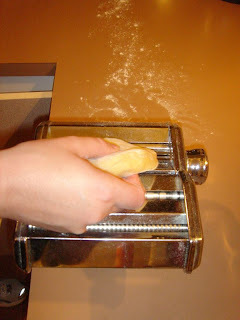 This will prevent the dough from shrinking back. You can use a rolling pin if you don't have a pasta machine. Some of us are lucky to have a pasta machine lurking in the back of our kitchen cupboards. If you do, now is the time to get it out. If you don't - now is the time to get one (just kidding). A rolling pin works just fine - you just need to be diligent with flouring your workspace and rolling your dough to the point where it is not too thick, not too thin. 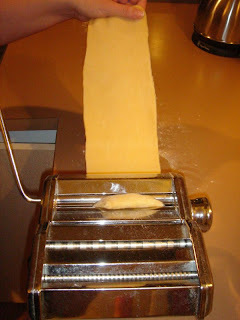 When using my pasta machine, I like to roll my dough to the thickness of the number 3 setting. I find it is just right for fettuccine and pappardelle. For ravioli, I will run it down to setting 2. 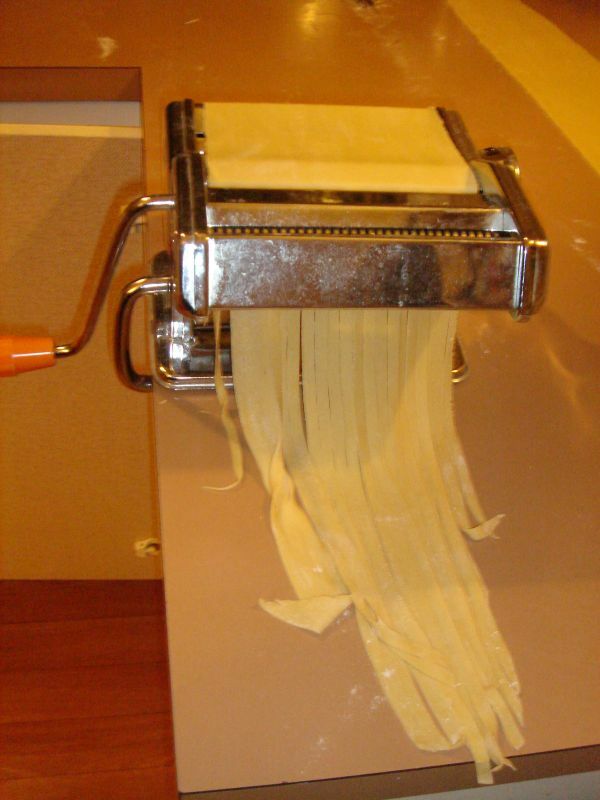 Be sure to keep the pasta lightly floured and separate to prevent sticking. 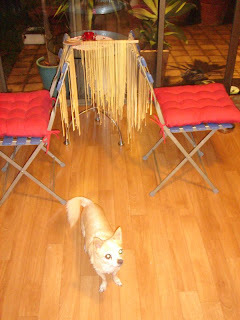 If you wish, you can hang your pasta to dry and it will keep for a couple of weeks. A wooden spoon between 2 kitchen chairs in a warm sunny spot of the kitchen works well for me. 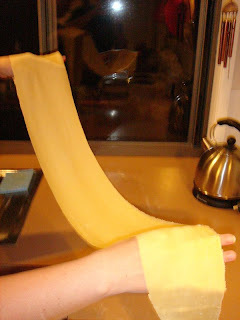 I love home made pappardelle - pasta cut by hand into 3/4 inch strips. 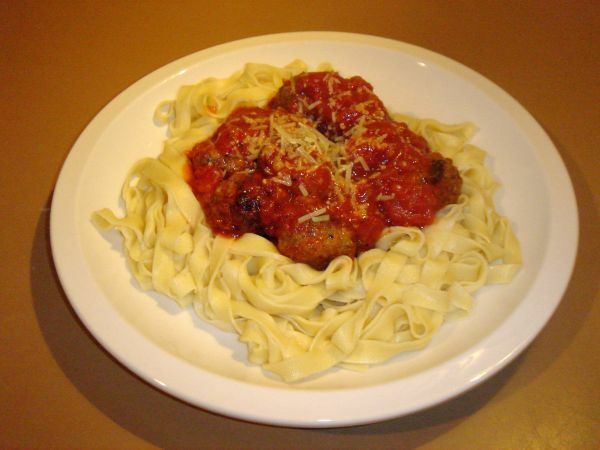 It is great to have with a rich, hearty ragu. It is even nice just hot and buttered. Bring a large pot of water to the boil. 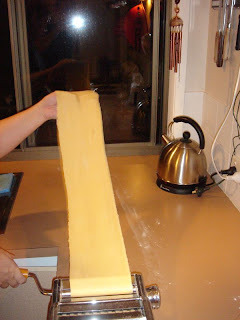 (About 6-10 litres - depending on the amount of pasta you wish to cook - a small pot will not do.) Add a good teaspoon of salt - as Nigella Lawson says, the water needs to be 'As salty as the Aegean'. 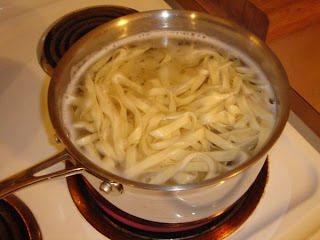 When the water comes to a rolling boil, add your pasta. I kind of gently shake it in to separate the strands. Be sure to keep an eye on your pasta as it cooks - it will only take a couple of minutes. Be sure to test regularly to make sure it is 'al dente'. It should be nice and soft but firm with a slight bite. Have your colander handy and be sure to drain well. Enjoy with your favourite sauce. OMG! You are SO making me hungry!!! The idea isn't to make you hungry - it is to inspire you to have a go!